Image courtesy of Pawyi Lee Wikimedia Commons. It matters in conversation, in fashion, in law, in academics, in nature, and even in architecture. Architects often like to think that their building is a work of art irrespective of its surroundings. The truth is that a building is a part of its location, a product of its setting, a transformer of its circumstances. Look outside your window wherever you are. What do you see? A neighborhood, an urban street, a country road that winds around a hill? Picture your absolute favorite skyscraper on that country road; or your favorite idyllic cottage in Times Square. Wrong wrong wrong, right? These examples are fairly obvious, but some distinctions are harder to see. Makes me think of the sweet house from the movie UP which fit its context fine when built, but then the city continued to grow around it and the context changed. 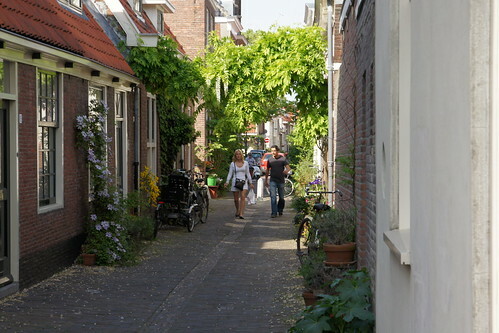 "A beautiful side street in Haarlem, the Netherlands"
Image courtesy of dfarrell07 via Flickr. The sidewalk is the street here, with houses up to the edge. Look outside again. What accommodations are there for cars, bikes, pedestrians? Are the sidewalks & streets separated, together, or not provided at all? If you are looking at a street, are there trees lining the street on one or both sides? Do the trees separate the road from a sidewalk? How far back are the buildings from the street? All of these town planning decisions affect the character of the place. 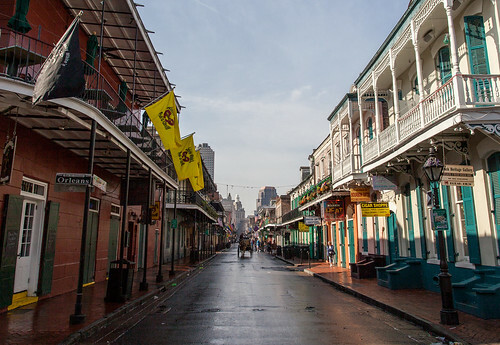 morning after the street was washed." Image courtesy of jkbyram via Flickr. Narrow street with covered sidewalks and balconies. Shops and restaurants below, apartments above. Our street is mostly houses set back about 30ft from the sidewalk, which is protected by a too-narrow park strip with flowering pear trees. At the intersection, though, are restaurants, a small grocery, a preschool and several other storefronts. I love that there are places to walk to, but not everyone would like that. 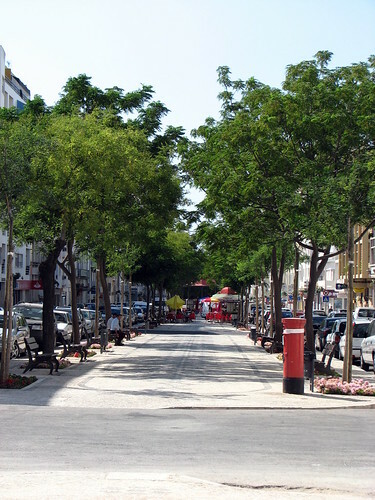 "Tree-lined street at Loule - The Algarve, Portugal"
Image courtesy of Glen Bowman via Flickr. sidewalk is in the middle and the cars travel on the sides. Look outside a third time. What is consistent and what is distinct about your location? Do you live on a street with all houses? Are there also restaurants, shops, churches, or other non-residential buildings there? Are you in an apartment above a shop (mixed use) or live on a downtown street with offices, condos, shops, a theater, restaurants, and a library like I used to? Final time, one more peek. Protection. Is your location exposed to high winds or fast traffic (like my otherwise lovely street), loud noises or 1000 pigeons and their accumulated waste? Are you safe from whatever it is you need to be safe? There are other aspects of context to consider. Traditional building practices in your region and even your immediate location should be considered. Maybe your town is known for its rock buildings or has a Baroque Spanish Mission influence. Enormous red barns or an extensive waterfront warehouse history count as well. You’re looking for materials and shapes and details too many to list. You’re looking for patterns. And culture can never be discounted. A tradition of shipbuilding means wood planks and bent wood and fine craftsmanship. A former county seat might have a stronger link to its past than to its present if the recent economy has not been kind. Tightly knit religious settlements often have lingering influence for hundreds of years and have brought their culture from afar. Historic locations are very meticulous about micromanaging these influences (think Williamsburg), but they are everywhere if you look. Regional Climate is a tremendous influence on building. The tropics require generous shade from their roof, raised floors to avoid damage from floods, and breezeways to keep the air moving. Cold climates need fireplaces, thick walls, basements, and fewer windows to keep the warmth inside. Every climate has a building response: and most climates have several. Microclimate-- the area around the immediate building site-- is important, too. Streams, hills, trees, tall buildings, shade, prevailing winds.... all of these elements influence a building's site and should be considered. Be aware of the context of your built environment wherever you go. Try to guess why things are organized the way they are. Would you do it differently? Some really great submissions of cool buildings, dumb buildings and crazy buildings. What stands out about your responses is that it's completely subjective what makes a building cool or dumb. It can be aesthetics or practicality, unusual details, scale, appropriateness, efficiency/wastefulness, structural integrity/failure.... the list is quite long. 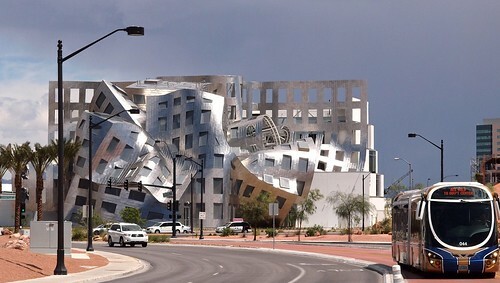 "Lou Ruvo, Center for Brain Health, Las Vegas"
Image courtesy of colros via Flickr. If you haven't done your field trip yet, be sure to do it when you have a chance. Buildings experienced only through photographs are not "experienced" at all. It's valuable to connect the "being there" to how it looks in images. Susan, excellent photos of the Center for Brain Health by Frank Gehry. Did you notice that you listed it as the craziest for the first part of the homework, then said it was "pretty" after the tour? I had the same adjustment when I visited Gehry's Disney concert hall in Los Angeles. Mr. Gehry is the one of the more well-known "starchitects" of our time, and his buildings are typically easy to spot by their materials and form. Did you see his guest star spot on The Simpsons? Before he used computer modeling to help him design his shapes, he was known for using affordable, unconventional materials like chain link fencing in his designs. He has always loved metals! Homework #002B: visit your favorite two streets in your city/town/neighborhood. Focus on the character of the street, not individual buildings. Describe what makes them appealing. Josh: "Why do most buildings just have corners why not curves?" Ally: It's all about the materials. Some materials are easy to build into a curve, others are more difficult. Bricks and small stones can easily make curved walls, while wood framed walls are best for linear arrangements. Those same masonry units can be plastered/stuccoed for a smooth finish, while today's framed walls are usually finished with rigid sheet materials like sheetrock and siding. Supposing you've got some lovely curved walls, how will you now get a roof on them? Curved, sculptural roofs are uncommon and often difficult to frame with sticks of lumber unless they are very small. 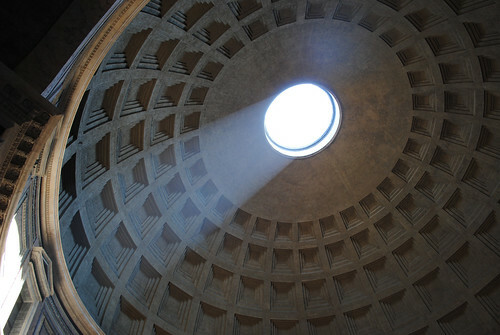 The oldest example of a curved building with its roof still intact (that I can think of) is the Pantheon in Rome. Although it has a massive front porch attached, the building form is basically round. Its walls were built of brick. Here's the fun part: the roof is made of unreinforced concrete*, and has an oculus (opening) in the middle. It was the largest dome in the world for more than 1300 years. Image courtesy of Greg Sass via Flickr. Image courtesy of majorjameshannah via Flickr. *Unreinforced concrete is strong like stone: it is difficult to crush. However, it is NOT strong in bending, it just breaks in half. That is why today we insert rods of steel reinforcing when we build with concrete: so that it will be strong in compression and tension. It is unknown how this roof/ceiling structure was constructed or why it has remained strong for so long. Check out this Pinterest board for tons of examples of round buildings, ancient & modern. And of course, check out Frank Gehry for buildings whose shape defy classification!